1. Know your travel needs. 3. Create a Demand Schedule of where you want to fly over the next year. 4. Work out all the ways to get there using award charts, and airline route maps. 5. Know your T-rate and adjust it as you move through Milenomics. 6. Keep track of your CPM using the MMR spreadsheet. 7. Book using your cheapest miles first. Decide if the differential between First/Business/Coach is worth it to you. 8. Use the Credit Card Calendar to apply for new cards every 3 months. Earn 32 miles per dollar or more all year long. Post a comment on this thread answering the question: “Where do you want to go with your Miles?” I’ll use some of the more popular answers in a future post showing tips/tricks to get there and back with Miles. You can also Follow me on Twitter: @Milenomics, and tweet your answer to the same question “Where do you want to go with your miles?” Use the hashtag #MilenomicsGiveaway to be entered. Again you must be a follower of Milenomics and tweet using the #MilenomicsGiveaway. I’ll allow you one entrance per day on both this page and the Twitter entries. All entries will be put together, and a random winner will be chosen. If you post more than once per day, or tweet more than once per day I’ll have to disqualify you for ballot stuffing. The contest ends on Tuesday at Midnight, I’ll announce the winner Wednesday Morning. That means you can enter 6 times, 3 by posting here, and 3 by tweeting Today, Tomrorow, and Tuesday. There’s some fine print on the passes you’ll want to review. 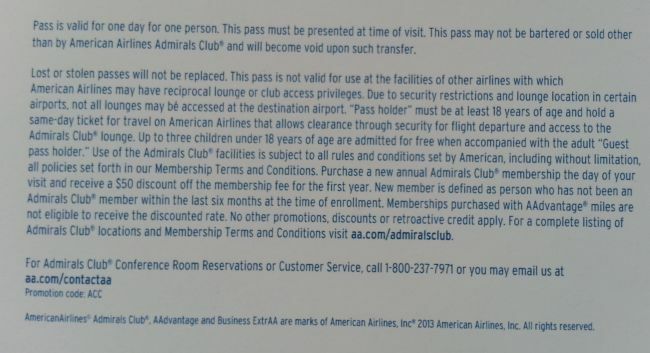 Most notably that you need to be flying on an AA Ticket the day you plan to use the pass. Two Admirals club passes can get you and a guest (plus 3 kids!) into any Admirals club that AA runs. I like using the lounges for their shower facilities when I’m traveling on long international flights. But Domestic lounges are also usually great for plane spotting and a little more comfortable for a long layover. Good luck, and remember to enter Today, Tomorrow and Tuesday. I want to go to Europe with my miles. And bring my parents from India to Boston in First class! I am hoping to go to South America with my miles! Congrats on finishing the first week! I would like to use miles to get to Bora Bora with my wife. I would like to take my wife to Paris next spring so she can see the gardens at Giverny. I want to use miles to go visit by son in Norway! I’d like to use miles to get to Vancouver and Bangkok (not at the same time 😉 ). I’d travel to Denver to see my childhood friend! I would love to use them to go to Kauai! I would like to go to the Faroe Islands! I’d fly to the UK with my daughter for our next yearly mother/daughter trip. We want to travel all over the island – some by car and some by train. Bozeman Montana, Skiing Big Ski next Spring, oh yea!!!! I’m going to head to Europe next with my points and miles. I would like to go to Rome, Paris one day soon with my miles! Rome next year, and Eastern Europe the following year. Keep up the good posts! I’d like to go to Germany! Morrocco or Eastern Europe (Croatia/Romania/etc) are all harder to get to w/miles I think. I would like to use my miles for a trip to Europe, a first class trip. cant wait to use my miles to get to detroit on amtrak and explore the quaint architecture!! Anywhere on Delta domestically using low level award availability! I use my miles to visit family all over the country, I save the vacations for my hard-earned money. I would love to take my wife and (unborn) son to Australia!!! I’d get away from it all with my wife in the Maldives! Iberia business to Madrid next summer – and then all over Europe! I would love to take my girlfriend to Bali and propose. I want to go to Phuket with my AA miles! I use my miles to visit family in India, and to bring them to us in Boston! I want to go back to CPT! Go back home to visit family in the Philippines would be nice. I’d take my niece to trek from Cusco to Macchu Pichu.